Online makeup store adds to its blush line by introducing dozens of new mineral blushes. 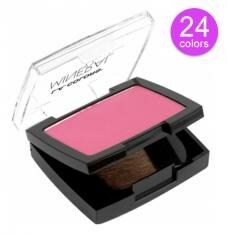 Mineral Blush is renowned for its lightweight feel, and natural appearance. Lady de Cosmetic is now carrying L.A. Colors Mineral Blush in 24 new shades. The online makeup store has announced the new addition to its extensive line of blush, which also includes blush options from Unik and Cameo Girl. The new mineral blushes come with a blush brush and mirror contained within the compact carrying case. “Mineral Blush is renowned for its lightweight feel, and natural appearance,” says Daniel D., General Manager for the rapidly expanding Lady de Cosmetic. The new color options range in shade from Dewy, a subtle pink, to Spiced Rum, a deep crimson. Coral and plum shades are also available to complement the diverse skin tones of Lady de Cosmetic’s clients. The new mineral blush, which is available online at a modest price point, is a complementary new offering from the online discount retailer, designed to work with other face makeup offerings from Lady de Cosmetic, including its newly introduced L.A. Colors liquid makeup. Described as “velvety,” by Mr. D., the new mineral blush “is long wearing, for an all day effect,” he adds. L.A. Colors Mineral Blush is the newest addition to the rapidly growing online retailer’s line of face makeup which includes complete makeup sets, pressed powders and foundation. The blush joins the growing inventory of L.A. Colors makeup carried by Lady de Cosmetic, which also includes hydrating lipstick, lip polish, lip liner, eyeshadow, mascara, eye pencils, liquid eyeliners, and nail polishes. L.A. Colors makeup has been featured in Lucky magazine, and Woman’s World magazine.